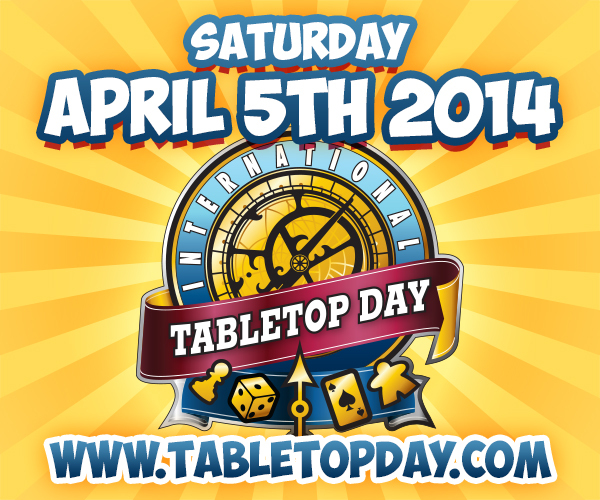 International TableTop Day is a celebration for all the fans of tabletop gaming. A single day where the whole world is brought together in a common purpose of spending time together and having fun. Here’s a round up of all the Irish events we’ve heard of, if you’ve heard of any more then let us know. Our own meet up on the day. We’ll be located upstairs in the Long Stone Pub in Dublin 2 from 12.00. On the other side of Liffey Geeks Go Gaming are having a meet up in The Black Sheep pub in Dublin 1 from 13.30. Dublin Comic Mart is on in the Central Hotel on Exchequer St. this Saturday and they’ll have tables set aside for gaming. And they’re open from 10am. The newly opened game and puzzle department in Eason’s on O’Connell Street will be taking part. This board game shop on Jervis Street will be taking part on the day. The Dun Laoghaire based gaming shop will be hosting an event on the day starting at noon and featuring board games such as Space Hulk, Settlers of Catan and Eclipse. Comic and gaming shop Sub City recently moved to a new larger premises on Dame Street and will be breaking it in this Saturday with some gaming. The UCD gaming society will be running an event on the campus from 12 noon. As part of their fund raising day for the BroCon Convention (Have been to it twice, good con) they’re taking part in Table Top Day. They’ll be taking part in Table Top day on campus. The Last Chancers are running an event in the Hobby Shack in Wicklow town. They’ll be running several events over the course of the day.